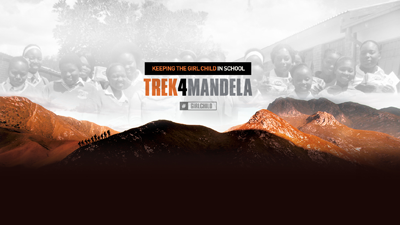 Close to 30 climbers will participate in this year's Trek for Mandela Day to raise funds for sanitary pads for needy girls. The expedition is expected to reach the Africa's Highest Peak, Uhuru, on July 18, former President Nelson Mandela's birthday. Last year's trek did not go as planned because one of the climbers, Gugu Zulu, died while attempting to summit. The tragedy won't halt the cause, instead more people want to help. Trek leader Sibusiso Vilane says this time around a different strategy will be used. "We are going to manage situations like that quite early before it’s too late. This year I am not going to split the group, we are going to stay together each step of the way which will give me enough time to assess everyone and make the right call." Richard Mabaso from Caring4Girls says the gruelling expedition will not only honour Madiba's legacy, but remember their brother Gugu Zulu. "We cannot therefore stay and not go to Kilimanjaro because of what happened. In fact we are more challenged to do a lot more because our dear brother gave his life for this cause. Now we have the Madiba legacy and the Gugu Zulu legacy to carry through." It may seem like a walk in the park, but it's a test of physical endurance, a 17-kilometre hike also with its pitfalls. Among the trekkers is local filmmaker Neo Matsunyane and for him and two others the journey will start at home. "We decided to go by road on motorbikes to raise awareness on issues on gender violence and talking to a lot of men. We will be travelling taking the sanitary tissues to all the towns and countries. We are going to challenge government to donate." With little over a month to go, the climbers will use every waking moment to get in shape. The final leg of training is a hike in the Drakensberg to acclimatise to an altitude of close to 3 000 feet above sea level. It’s a trial run of how to cope with possible symptoms of mountain sickness when on the actual expedition.